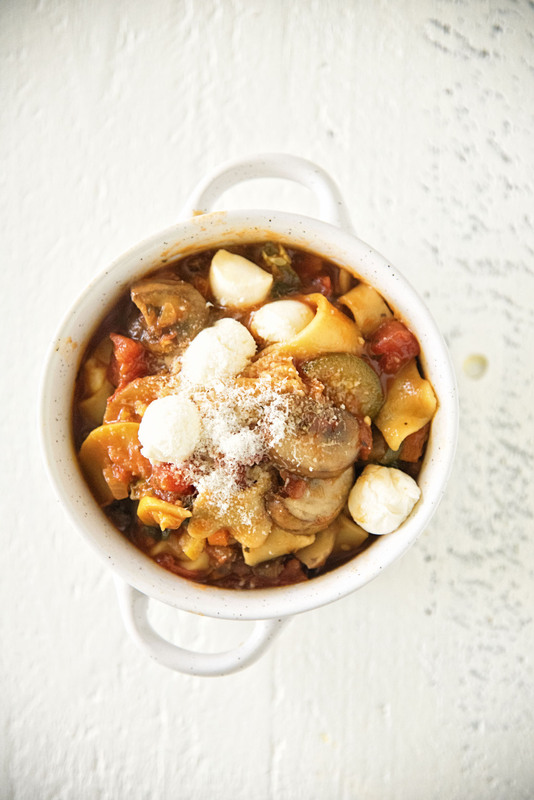 Vegetarian Lasagna Stew: Hearty vegetarian stew made with lasagna noodles, mushrooms, zucchini, yellow squash, tomatoes, and mozzarella to help keep you warm on a chilly night. Every Christmas Eve since I existed, my mom has the tradition of ordering pizza. For the obvious reason that she has cooked and baked up to that point and will be cooking all the next day too. The pizza tradition has taken many forms over the years depending where we were. When my parents first moved to where they retired there was no pizza place. It’s a small town and it was even smaller back then. So…we made pizza English muffins. We’ve had to do that few times over the years. There were years that I was so diet crazy that my pizza was frozen cardboard Lean Cuisine pizza. Yuck. When we are in the thick of the holidays cooking can sometimes seem like a chore. It’s why I love to make soup. 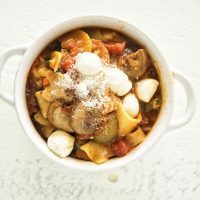 This isn’t made in a crock pot or Insta-pot so it takes a little time…but really it doesn’t take that long. 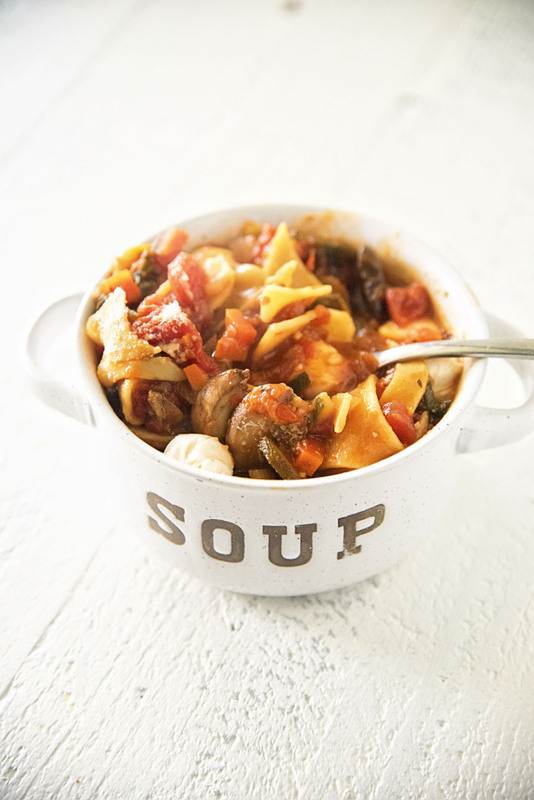 This is adapted from Lasagna Soup recipe. But I even added more sauce than what it called for and it was super thick. I’m guessing because more veggies than what they originally used…sausage. Feel free to use sausage if you prefer over some of the veggies. 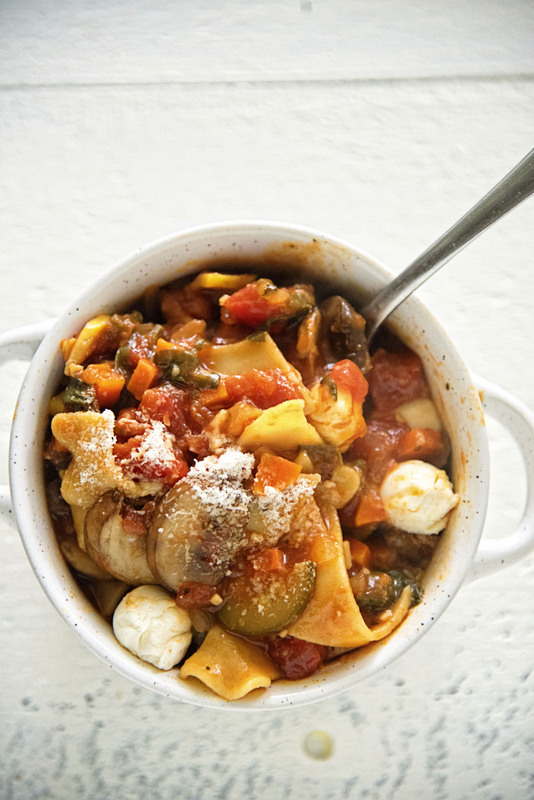 This is hearty and tastes just like lasagna in a bowl. Everyone I have made his for loves it especially if I don’t point out that it’s vegetarian. If you leave out the cheese it’s Vegan. Heat 1 TBSP olive oil in a large saucepan over medium-high heat. Add the onions and carrots and sautéed for three minutes. Stir in the mushrooms, zucchini, squash, and garlic and sauté for three minutes more. Add broth, tomato sauce, and tomatoes and bring to a boil. Stir in pasta and simmer until cooked, about 10 minutes. Add spinach and cook until it wilts, about 1 minute. 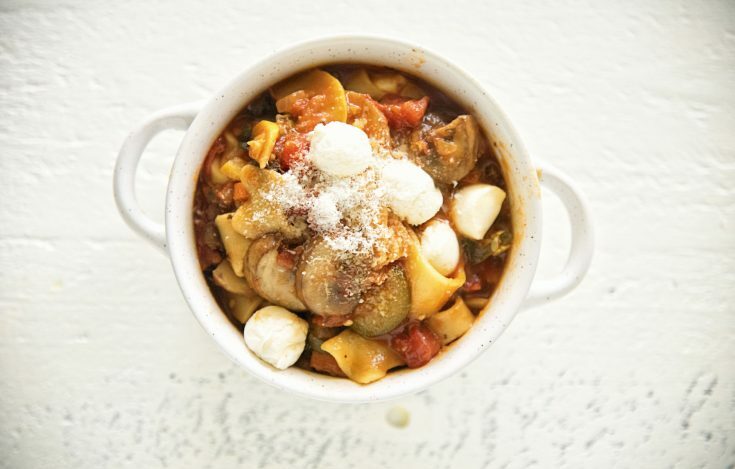 To serve, place diced cheese (or cheese balls) in each serving bowl, then ladle stew over to melt. Garnish with Parmesan and basil.